Physicists have yet to discover the Higgs particle, which is necessary to complete and substantiate their current standard model of particle physics. If it is not found many scientists fear they will have to go back to the drawing board, and admit that the laws and physics ruling the universe on a fundamental level still eludes them. Theoretically speaking, the Higgs boson adds mass to particles. This brings up an interesting question for me. You see, most scientists also believe that the human mind and its operation is an epiphenomenon—a mere microscopic outcome of numerous electro-chemical processes in the physical brain. Human consciousness and mind is simply the outcome and mechanistic dynamics of dead matter. This means we need to have a purely physical answer as to why some human ideas carry more weight than others. Do heavy thinkers attract more Higgs bosons to their notions? This, of course, is absurd. After all, we can all easily conclude that weighty ideas contain more complexity and details than our everyday thoughts. No one is saying that the Higgs boson adds more complexity to the structure of our thoughts. Hmmm? We have a discrepancy here between matter and mind. If nature consists of laws that are inwardly consistent (constants) then these laws should hold for all physical processes. Including those of a physical brain. But they don’t! A disciple of Einstein’s physics, David Bohm, suggested that contrary to the reductionist and simplistic notions of modern physics, the deeper you go into nature the more order and complexity you would find. He called this deeper view of reality implicate or enfolded order. Most surprisingly, within this enfolded order, space and time are no longer the big factors in determining the relationships and connections of various elements. Scientist/theologian, Emanuel Swedenborg had anticipated the idea of implicate order two centuries earlier. In fact, he took the ideas of implicate order all the way to the spiritual world and the Lord God’s heavenly kingdom! Swedenborg maintained that the spiritual world contains real substance, complex structure and living process—outside the constraints of time and space! This suggests that we should give similar consideration towards the Bible and its sacred architecture. Swedenborg offered a rationally scientific approach as to how all things were indeed created through God’s Holy Word (John 1:1-3). He offered a multi-leveled interpretation and exegesis of the Sacred Scriptures that provides powerful evidence that its stories and narratives contain implicate orders of information! This means nature and ultimate reality finds its multi-leveled (sandwiched) structure from the patterns and complexity of God’s Word! That is why I believe that Emanuel Swedenborg will become the most studied thinker in the 21st Century and that the hottest topic will be unifying science with theology! This entry was posted in god, metaphysics, Reality, religion, science, unity and tagged Bible interpretation, complexity, David Bohm, Emanuel Swedenborg, Higgs boson, implicate order, mind, non-physical process, reductionism. Bookmark the permalink. 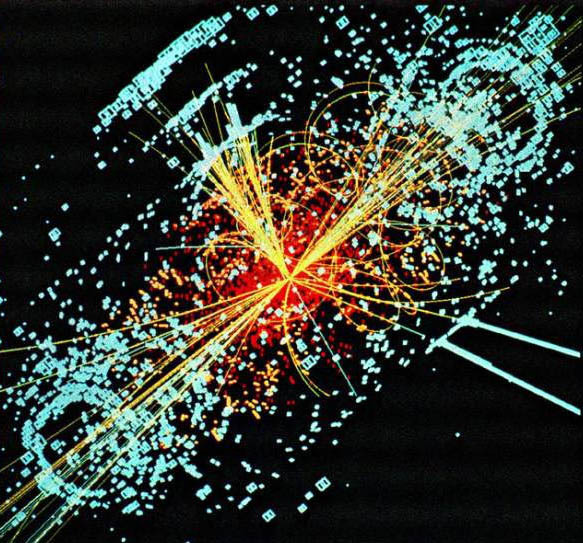 6 Responses to Does the elusive Higgs boson add weight to our ideas? I have found that you cannot bore people with the truth. In simple terms, what are the implications to the faith in finding or not the Higgs boson? Thanks. There are no implications unless you are interested in theistic science (unifying theology and science). If your faith and science are flawed their combination will not represent reality or truth. My second book “Proving God” unifies science and theology by offering new ideas concerning both. Shall get hold of the book soon. Hoping there are significant insights to munch on. Readers have told me that the Table Of Contents alone is a mind-bender! Bon apetit!